Some of my readers have expressed the view that I am occasionally unnecessarily harsh in my posts. However, it is very unlikely that this post will elicit such a response since it is taking a rather critical look at the entrails of my own dissertation. While that was obviously a very long time ago, what I did then or rather what I did not do then is perhaps still worth looking at today. Basically, I must have been so preoccupied with the main result of my dissertation – the small cap effect – that I completely missed documenting a second result that was staring me in the eyes and that would have been as interesting. My dissertation was about diversification and its limitations; the small cap effect was a somewhat unexpected empirical byproduct. At the time, the capital asset pricing model (CAPM) was still held in high esteem in academic circles and the finding that beta was not the only factor driving returns but that market capitalization also mattered was not overly welcome among the supervisors of my dissertation. Consequently, I was “encouraged” to perform all kinds of diagnostic tests to ensure that the result was not just due to some kind of statistical problem. I had formed twenty-five portfolios made up of all stocks that were listed on the NYSE at any given time. First, all stocks were assigned to one of five portfolios (with equal number of stocks) based on their market capitalization. Then, the stocks in each of those five portfolios were assigned to one of five portfolios based on their beta. This elaborate procedure was designed to reduce the error-in-the-variable problem since beta cannot be known but has to be estimated. Thus, I ended up with a time series of returns for twenty-five portfolios with different betas and market capitalizations. In every month, I then performed a cross sectional linear regression of those returns on beta and market capitalization. Were the CAPM correct, the regression coefficient on the market capitalization would have been zero (in a statistical sense) and the coefficient on beta would have equaled the market risk premium. In reality, the coefficient of the market capitalization was significantly negative, on average, documenting a size effect in the US market for the 1931-1974 period. 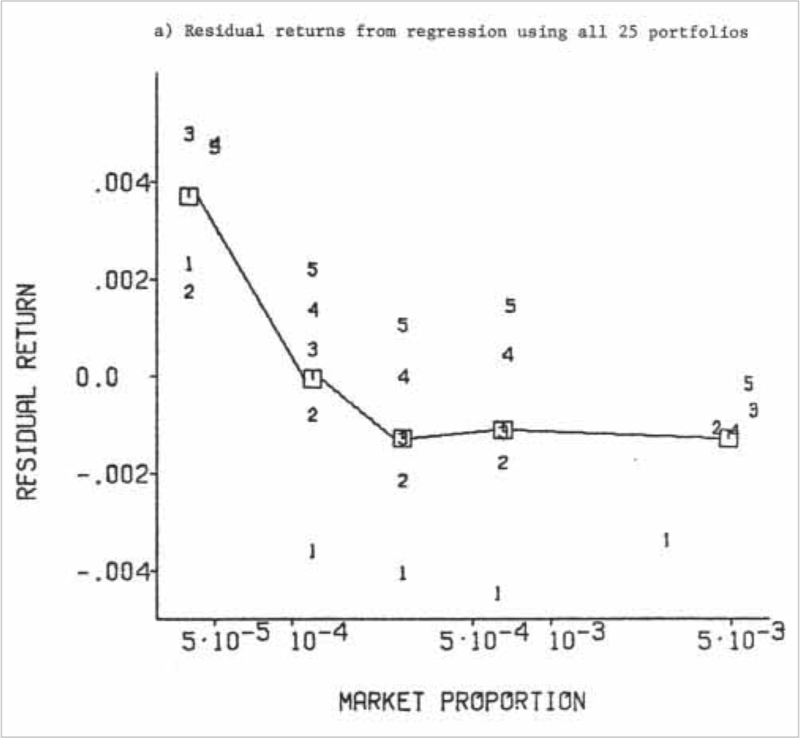 Among the diagnostic checks that I performed were several analyses of the properties of the residuals of the regression, i.e., the unexplained part of the returns of my 25 portfolios. In one of those checks, I regressed the portfolio returns on beta alone to obtain further information on the nature of the relation between size and return. The results of this diagnostic check are shown in the chart below, which is reproduced from page 95 of my dissertation. The vertical axis shows monthly average residual returns and the horizontal axis shows the market capitalization (expressed as market weights and using a log scale). The boxes represent the average residual return of the five market cap portfolios, the digits 1 through 5 show the residual return of the five beta portfolios for each size group, where 1 denotes the highest beta portfolio and 5 the lowest. The chart shows that the size effect was not nicely linear but that there was a significant outperformance of what are now called micro caps with the other four quintiles having largely similar risk-adjusted returns. This is why we now talk about a small cap effect rather than a size effect. The micro caps had outperformed the rest of the universe, on a risk-adjusted basis, by about 40 basis points per month for the 1931-1974 period (please resist the temptation to compound this number). At the time, I considered this result to be somewhat inconvenient. A significant underperformance of the mega caps would have lent itself to a more intuitive explanation. But there is actually another result lurking in this graph that I completely overlooked at the time. It is just as striking as the small cap effect: the return spread of the beta portfolios within each size group. Were the CAPM beta a reasonable measure of risk, then the five portfolios for each size group should have had similar average residual returns. In reality, the low beta portfolios (the 5s) largely outperformed the high beta portfolios (the 1s) even after the adjustment for beta risk. The magnitude of the risk adjusted difference between high and low beta portfolio returns is similar to, if not larger than, the outperformance of the micro caps. Once you look at it, the result is blindingly obvious and cries out for an explanation. But, at the time, nobody asked any questions and I did not pursue it. Now, of course, we know what this result was all about. The low beta (or low volatility) anomaly has recently received a lot of attention in the literature. One study in the FAJ found significant negative differences between top and bottom beta and volatility quintiles for the 1868-2008 period. Another recent study even suggests that Warren Buffett’s success was based largely on the pursuit of a (levered) low beta strategy. My graph shows that the anomaly had been there at least since the thirties. Why did I not pursue it? Perhaps it was temporary blindness induced by dissertation fatigue. No matter. But it is unfortunate that I missed the opportunity to document the result thirty-five years ago. That second result added to the small cap effect might have accelerated the demise of the CAPM as a serious model for asset pricing and we might have been spared decades of pointless discussions about the merits of single factor asset pricing models.